A vintage photo of the Majestic Hotel, 7th Street and the Boardwalk, damaged by fire in October 2013. 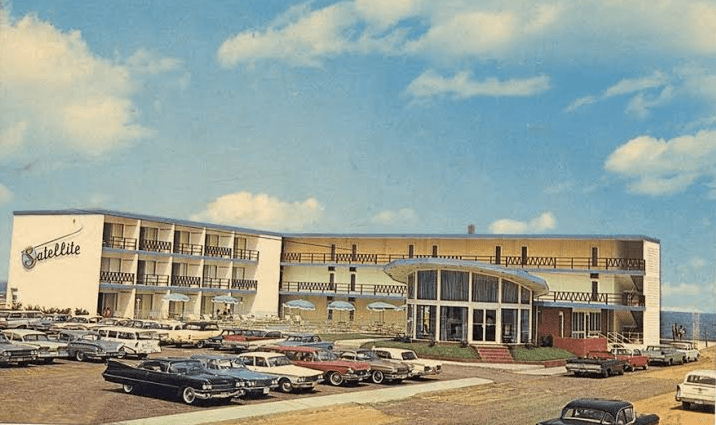 Chain hotels have steadily replaced wooden guest houses with front porches; buses the size of those in Baltimore now ferry tourists from the Delaware line to the inlet; and while many cherished old faithful eateries remain, a new sub shop or crab shack opens every year. Lifelong Worcester County resident Hunter “Bunk” Mann grew up just outside of Ocean City and it has been his passion to preserve as much of the resort’s history as possible. 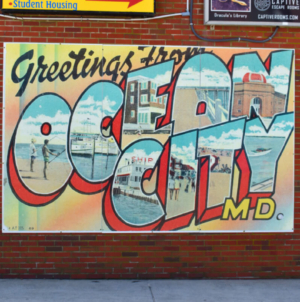 Before the end of this year, his work will be available in Vanishing Ocean City, a beautifully illustrated coffee table book filled with a century-and-a-half of memories. Now a 68-year-old grandfather, the longtime Eastern Shore insurance broker lives away from the action in Ocean Pines. But Mann crosses the Route 90 bridge into Ocean City as often as possible, especially when chasing down another old-timer for an interview. Set for release by Labor Day, 2014, Vanishing Ocean City will be a hard-cover keepsake alive with a hundred voices. It includes interviews with more than 160 people over the past seven years and is illustrated with more than 300 photos, many never published before. Of the scores of people Mann mined for their memories, most were 70-years or older with none younger than 50. “The oldest person I talked to was Pete Cooper, chief engineer when they were building the Route 50 Bridge,” said Mann of the longtime Salisbury city engineer. “Pete was 98 when I talked to him and he lived to be 102. Though his collection of vintage Ocean City postcards runs to about 600 items, the one image he has not been able to find is a picture of Shorty the Blind Banjo Player. Shorty reportedly lost his vision as a boy while chipping away at ice that had built up in the freezer of an old refrigerator. He said that he severed a Freon line and the vapor destroyed his eyes. 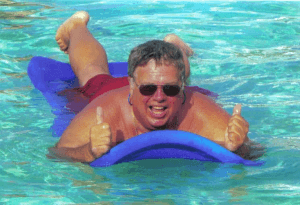 As an adult, Shorty finger-picked and strolled the Boardwalk with his guide dog. He played for loose change and a kind word- and often more than that from good-hearted folk with half-a-load-on. The banjo still rang out in the mid-1980s, though Shorty is surely on the far side of the surf now and tales about him have long been scarce. “I’d also like to find a picture of Tex, another one of the Boardwalk singers from the 60s and 70s,” said Mann, who turns 68 on March 11. Like the long-gone Tex, Bunk is also a guitar player, coming of age in the pre-Beatles, “Joe College” crew cut years of the early 1960s. His high school band was called “The Electras,” named for a hot Buick of yesteryear. For a couple of summers Mann worked as a “beach boy,” renting chairs and umbrellas and inflatable surf “mats” – navy blue and maroon, ridged and made of thick rubber – from stands in front of the Boardwalk. 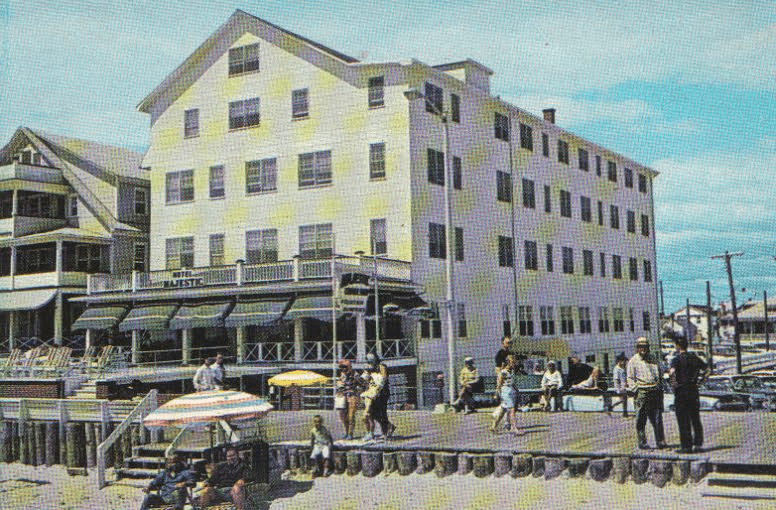 The “Showell Block” (1963) long home to businesses by one of the resort’s oldest families. In 1962 and 1963, his spot was in front of the Hastings-Miramar Hotel. Sixth Street was his 1964 assignment and the following year – which saw the Beach Boys of Hawthorne, California release “Girl Don’t Tell Me” – Mann worked just off the George Washington Hotel on Street. Both hotels, and many others that perished by arson or bulldozer, are in the book. Good times with good people, days that each new generation – from the post-World War II vets who slept on cots at a dormitory on the Showell Block to the YOLOs of today (you only live once) – thinks will never end. Todd Ferrante, the king of Park Place Jewelers, worked at his family’s “telescope” photo business, hooking up many with key rings full of kids and grandkids squinting inside a plastic telescope. 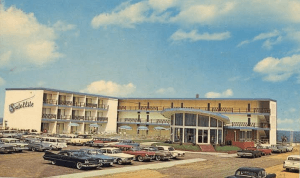 An early 1960s postcard of the Satellite Motel, long gone. The Satellite Motel was where the Jetsons stayed (daughter Judy in a bikini, baby) and the Trimper “Fun House thrilled old and young. 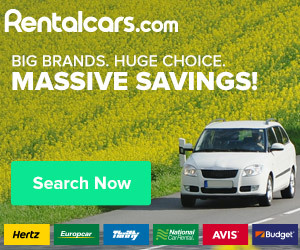 The thrills, as Frank Zappa once observed, were cheap. The Fun House was torn down in 1972 and replaced by Sportland. Bunk will be working on the book through the summer of 2014 and is willing to hold the presses to get as many gems in as possible. Any photographs from the late 19th century are welcome and if his search doesn’t turn up rare goodies for the upcoming edition, Bunk will begin working on a second. Affable and generous with his time, Mann is easily reachable on Facebook and the Mann & Gray insurance office in Fruitland. “I started the project seriously in 2008 with interviews. But I never really thought about doing a book until about ten years ago when they began tearing down some of the old hotels and I went to get pictures before they were gone,” said Mann. In November of 2004, he took his mother (the former Hannah Grashl, born in Austria in 1919) with him to watch the Belmont Hotel on Dorchester Street come down. An OC resident for decades, she turned to her son and said, “It’s so sad – everything I remember about Ocean City is being torn down. And Bunk Mann had the title for a book not yet written. It is well documented (though not always believed) that when we die, we leave our possessions behind, be they Chevrolets or surfboards. 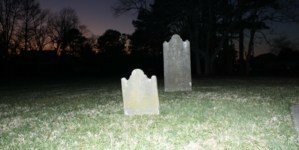 What many realize too late (like an old Memphis sweetheart of mine who kept reaching for the phone to call her mother for a recipe after her Mom had passed) is the deceased do take some gold with them: their stories. Bunk is making sure the folks in Ocean City don’t take all of them. As always, Alvarez has written a real gem that tugs at our heartstrings. Trimper’s, the Satellite Hotel, baby oil with iodine and Buck Mann(or someone just like him) are just a few of my favorite things growing up in Maryland. It always starts out about the place, but Alvarez’s love of people takes over, and he introduces us to real people who we all know and love. Excellent work, and looking forward to reading Buck’s book. Perfect combination of Buck Mann and Rafael Alvarez. The two of them are the same species. 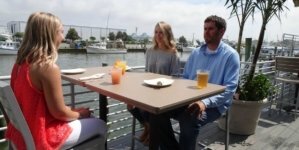 Alvarez in Baltimore and Mann in Ocean City. Would be interested reading more about the. Old Ocean City days. Lov seeing the old pics and reading the stories! I grew up with Bunk Mann. I remember the sing-a-longs, though I remember calling then Hooteannies. Bunk is right, it was barren up after 94th! I also remember the local police confiscating our beer, which we were too young to have any way! Then they drank it! It was a fun time growing up close to there! Spent most of my summers there when my parents didn’t make me work out in the fields! I’d love to see your book Bunk! Bet it’s great! Another home run by Rafael Alvarez. No writer has a greater ability to connect with Maryland readers. His stuff should appear more often. 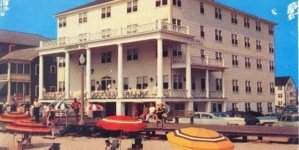 i would love to hear more about the old ocean city days and people how great of a story that would be. the part about when he went and brought his mom to watch them tear down the building and she turned to him and said its sad 🙁 it truly is sad very sad to see what once was such a wonderful piece of history be taken away and replaced.. I can’t wait to have a copy of Mr. Mann’s book! 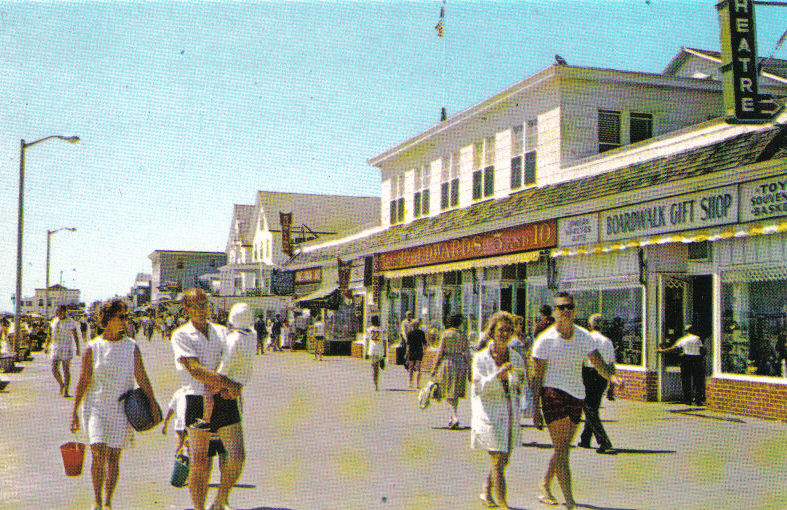 I miss “Old” Ocean City. Now a mom, I walked down Coastal or the boards and share stories, alongside my husband, about what “was” to my kids. Thanks for stepping up to preserve the memories! I purchased my signed copy of “Vanishing Ocean City” from the Life Saving Station last week on my annual trip to OC, MD. If you have even a passing interest in the history of the greatest Atlantic Coast shore destination you will be very happy with this book. Being someone who loves Ocean City (Maryland of course) and having countless fond memories of my stays there I found the book to be a fantastic read. I am through it already and started again to make sure I didn’t miss anything! Great work Mr. Mann! Always wanted too ask, Mr. Mann about his book there is no mention of Jarvis Reality, Jim Caines competition…and The Ocean Villa on 75th street we always stayed on that street since the ’60s when it was built it was one of the first 3+ story beach front condos, and The Back of the Rack of the ’70s-80s….and what a great restaurant the Quarterdeck was…..should have a second volume about the family places too stay in the ’50s-70s…in up town..like the Gale Winds on 75th….The Salty Dog same area…..love his book….thanks, Bunk Mann…. Rich Brady…..
Hi everyone, It’s snowing here in Dover today. I’m taking a stroll down memory lane, and reading this article is so refreshing. My grandparents had a place in Fenwick for years. I remember working at the beach every summer, and having the best times. There was a LUMS family restaurant right over the MD line. I worked there. There was The Pier Ballroom that my friends and I went about 3 nights a week Our favorite band was Blessed from Baltimore. Bob Murray was the manager and always made sure we had an good and safe evening. Dave Zann made sure we had sodas and popcprn!! When I was older and waitressed…we would close and go to the After Hours Club. Sometimes we’d go to The Lemon Tree for breakfast. So much energy in the air! I loved it and will always miss it!! !